Eclectus parrots come in a variety of sub-species, including the Grand Eclectus, the Vosmaeri, and the Solomon Island Eclectus (Eclectus roratus solomonensis) which is the most commonly found Eclectus in captivity. Originating in the Solomon Islands, this bird is prized for its stunning appearance and great pet quality. A little harder to find than some of the other parrots of this size. The Solomon is easily recognizable once you do find one — you can’t miss an Eclectus! Their feathers do not have a distinct outline like the feathers of other birds. Eclectus parrots look as if they are covered with a fine fur, and along with their day-glow colors, the effect is astounding. Eclectus are dimorphic, meaning that there are visual distinctions between the sexes. Males are a bright green and have a horn-colored beak. They have splash of bright blue on the wing and a bright red underwing. The females are a stunning red with a deep violet belly and a black beak. In fact, because of these differences, these birds were not bred successfully for many years. Breeders were putting males with males and hens with hens!. It wasn’t until a couple of decades ago that someone realized that the green birds were male and the red birds were female. 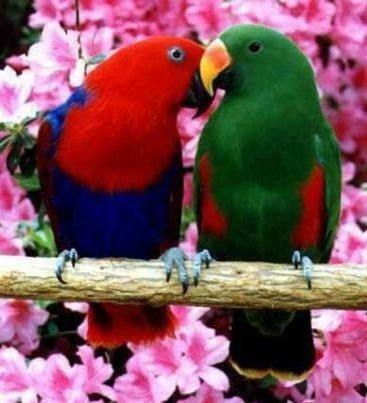 Eclectus parrots are intelligent, gentle birds that become welcome members of the family due to their tranquil nature. They are pretty good with children, though they will not tolerate frantic activity or constant disturbing noise. It will be important to teach children how to behave around the bird, rather than the other way around. 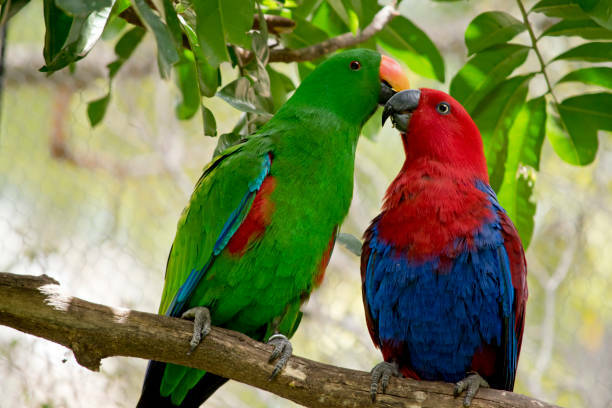 Female Eclectus parrots — even those kept as single pets — have strong nesting instincts and might be inclined to seek out nest sites in dark and enclosed areas around the home, such as in cupboards and underneath furniture. Females can be quite territorial, especially during breeding season. If you keep a male and female pair, the female will likely be the bossier of the two. Eclectus diets are different to that of other species of parrots due to the fact that they have a longer digestive tract, this means they do poorly on pellet diets as they can cause a vitamin overdose which can result in feather destruction , toe tapping and behavioural issues such as screaming and aggression. 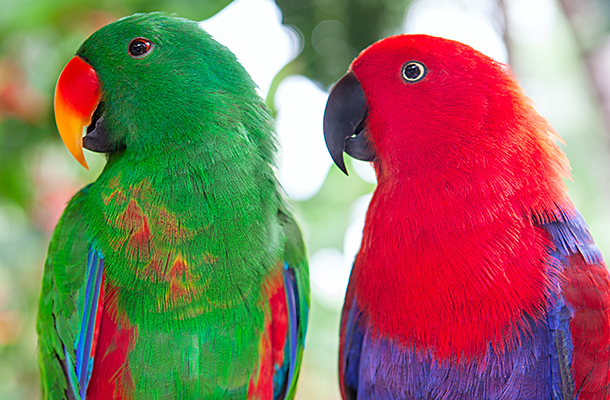 Coloured and artificial foods can also cause problems to the Eclectus Parrot. Eclectus parrots Digestive tract being longer in the Eclectus means that food takes longer to digest. This allowing them to absorb low nutrient foods better. Which is why they do much better on a natural based diet. The recommended diet for an Eclectus is atleast 80% natural food as in veg and fruit. More veg than fruit due to the higher sugar content in fruit. The rest made up of a good seed mix that does not contain peanuts and very little or no sunflower. Pulses, grains and sprouted seeds. Sprouted seeds are very good part of the diet and particulry good if you have a fussy eater. By offering sprouted seeds this will give them the majority of vitamins that they require. They tend to be grazers and love foraging but so long as a healthy diet is provided they should not become over weight. Foods such as chicken, meat, fish and egg are not recommended for Eckies unless they are plucking, molting or laying as this can cause health issues, vegetable protiens are much better such as beans or legumes, please note these must be cooked fully. Supplements are not recommended unless your avian vet recommends them as this could lead to vitamin overdose. Egg is not recommended on a regular basis as it is high in cholesterol. It can help during a heavy molt other than that one a month is the recommendation.